"I'm a student with a low budget...They are super flexible & will find you something fast & reliable! If looking for a car, stop looking & go here!" I had a wonderful experience, everyone was great and it was a very welcoming atmosphere. 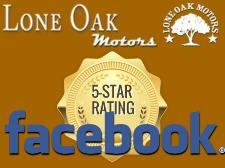 I would highly recommend Lone Oak! "...my best experience working with a car dealership....I will for sure come back to Lone Oak Motors if I need a new car!" They were very helpful and friendly & made the sale of my car quick and easy! *****FIVE STARS***** Run by good/honest people!! ...low pressure, high quality experience...couldn't ask for better service during the sales process & after. Highly recommend them! "...These boys are the best!!! I came in from California to purchase my vehicle!" they gave us MORE than a fair trade for our car and they did everything for us. never have I bought a car that was this easy. "...Great people, thanks Michael Coffey for going above and above." My wife & I bought several vehicle here over the last 5 years & to date haven't spent over $350 on repairs over the life of our ownership. "The Mercedes-Benz S550 I purchased was everything as shown on website. No matter where you live, no drive is too far for this kind of service."